Maybe some of you saw the article from the Wall Street Journal on August 30, 2014. It graphically depicted (see the accompanying screenshot) all the various relationships among political actors in the Middle East and how they changed from enemies to friends or discovered common interests. So, historically Iran and the United States have been at loggerheads but Iran is a Shiite country and ISIS is a Sunni movement therefore Iran and the United States are in league with one another against the common Sunni enemy. Shiite Iran and Sunni Saudi Arabia have been fierce competitors but both parties now have the same enemy in the radical Islamic movement. It’s the old story that “the enemy of my enemy is my friend.” You can read more about it at the link above. The various combinatorial factors of allegiance can be actually quite humorous if we carry out this “enemy of my enemy is my friend” shibboleth far enough. 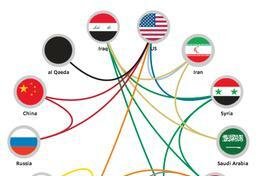 ISIS is a threat to Al Qaeda therefore Al Qaeda and the United States can form common cause. Syria has no love loss for ISIS so we can coordinate with them. Even Israel, who almost nobody chooses as a dance partner, shares interests with Egypt in opposing Hamas. While these political associations have some element of truth to them, they are highly temporary, ad hoc, and abstract. They might cooperate for a couple of minutes behind the scenes but don’t count on the development of quality new relationships. There are too many problems and inconsistencies to forge much of a relationship. Moreover, if the United States does cooperate with one group they antagonize another. Can you imagine the US actually getting closer to Iran and the implications of that for our relationship with Israel and Saudi Arabia? That would be a complex dance indeed. Actually, the potential alliances are quite confusing and our judgments about the various alliances are probably distorted by media images and their general lack of information about ISIS. Still, they do represent examples of commonalities that we are always calling for. We are surrounded by media messages pertaining to violence when it comes to news and information about ISIS. The availability heuristic would predict that we use and overemphasize information that is easily available to us. Since we can imagine images of violence easier than ones of peace and reconciliation, simply because these images are more available, we tend to think that such images and relationships are more characteristic of the conflict. And certainly the same is true of the negativity bias, which holds that negative information is more easily attended to and brought to mind than positive information. So when we think of the Israeli-Palestinian conflict we think of negative things such as violence, religious differences, and a whole host of tragedies that cause us to remember those more than anything else. These heuristics of negativity and availability can fundamentally define an intergroup conflict and contribute significantly to its intractability. There is no escaping the requirement that any genuine and diligent effort to resolve Islam-West differences must confront extremism and violence. The first step, and this will be difficult for many, is to view extremism as a genuine relational term that is a reaction to economic and cultural issues. Hence, the issue is a problem that requires efforts from both sides. Defining a problem relationally implies a similarity dialectic; it forces the two parties to interpret differences as similarities or at least the recognition of mutuality of the problem. These common enemy situations can play a part. If there is going to be a compatibility perspective rather than a rivalry perspective, which is an initial crucial step toward ameliorating conflicts, then extremism must be confronted. These temporary relationships are opportunities for contact and defining problems more relationally. They at least provide entrées into the issues. The current conflict represents simplistic belief systems that reduce the other side to essentialist practices and end up rendering everyone uninformed. For Muslims the fundamentalism gravitates toward puritanical religious ideology that defines offenses and outsiders. For Westerners fundamentalism equates liberal democracies with the natural flow of history and market economies as beyond criticism. Real security is not a private good but one that is achieved by developing consensus, and cooperation, and interdependence – all relational terms. Justice cannot be imposed by one side but must be a concept that binds the two sides into a just relationship. They need a bigger story, another narrative that continues to develop the narrative of complementarity and compatibility. These temporary interdependencies formed against common enemies allow at least a toe if not a foot in the door. Posted on September 15, 2014, in Communication and Conflict Resolution, Political Conflict and tagged extremism, ISIS. Bookmark the permalink. Comments Off on Managing Extremism and Dealing with ISIS. What happens if he’s the nominee in 2020? The survivors of California’s most destructive wildfire in history remain resilient in the meantime. But the meantime has no discernible end. After enormous black turnout in the 2018 midterms, Republicans are advancing a bill that would penalize voter registration drives.